With a wink and a nod to Bram Stoker, bestselling author Cynthia Leitich Smith unites the casts of Tantalize and Eternal in a delicious dark fantasy her fans will devour. Quincie Morris, teen restaurateur and neophyte vampire, is in the fight of her life — or undeath. Even as she adjusts to her new appetites, she must clear her best friend and true love, the hybrid-werewolf Kieren, of murder charges; thwart the apocalyptic ambitions of Bradley Sanguini, the seductive vampire-chef who “blessed” her; and keep her dead parents’ restaurant up and running. She hires a more homespun chef and adds the preternaturally beautiful Zachary to her wait staff. But with hundreds of new vampires on the rise and Bradley off assuming the powers of Dracula Prime, Zachary soon reveals his true nature — and his flaming sword — and they hit the road to staunch the bloodshed before it’s too late. Even if they save the world, will there be time left to salvage Quincie’s soul? 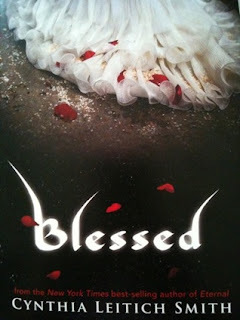 Blessed is the final installment in the Tantalize series and combines the characters in Tantalize and Eternal. We catch up with Quincie right where we left off in Tantalize. She is a vampire and her maker, Brad the head chef she hired for her vampire themed restaurant, has given her a choice; go with Brad and live a life of damnation or drink from her best friend (who is also a wolf and her not-so-secret love) Kieren. Brad is certain that because Quincie is a new vamp, she will drain Kieren completely dry. Brad is wrong. Quincie stops herself from killing Kieren and Brad has no choice but to leave the bloody scene empty-handed. Because Kieren has been framed for a few deaths in Tantalize, he joins a wolf pack and leaves Austin. Quincie is devastated when Kieren leaves. She tries to focus on Sanguini's by hiring new kitchen and wait staff. As luck would have it, Nora the head chef for the drac in Eternal, and Kenny the party planner for Miranda relocate to Austin. Also, Zachary is officially assigned to be Quincie's guardian angel. Although she has the distractions of the restaurant, school, and her new friends, Kieren is always on her mind. Worse, she now lives with Kieren's parents and has moved into his room. Quincie begins to go through Kieren's books to find answers about her 'condition.' When Quincie runs across a copy of Bram Stoker's Dracula, everything changes. Characters from past and present join forces to end Brad for good. First, they need to find Kieren. Vampires looking for a wolf pack isn't exactly tea at the Plaza. I am thankful for the way Smith reminds the reader the events in Tantalize and Eternal. It has been a very long time since I read the first book in the series, and I worried about being lost. Not the case here. I think the summarization of the previous novels at the beginning of Blessed was one the best summarizations I've read in a YA. With other books I have had to refer back to the previous installments when confused. I didn't have to do that once for Blessed. I also appreciate that the summary of events in the previous installments weren't dumped on me in the first chapter. They were integrated seamlessly over several pages and chapters. I love it when a series comes full circle and all questions are answered. I had that feeling when I finished Blessed. I didn't feel cheated or wonder why the events took place the way they did. Blessed reads as if Smith had a plan all along. I'm quite sure she did.... Blogging from Austin, TX, I was happy to read about some local places. I recognized street names, parks, restaurants, and even the lake I live next to. That was a special touch that I hope some Texans appreciate. The utilization of Bram Stoker's Dracula was a double edged sword for me. On one hand with no spoilers, how cool! I had zero clue "that" was coming. On the other hand, I was a bit confused. I think if a reader had a little more background with Stoker's novel, they would fare a bit better than me. In the end, the cool side of the coin won over the confused side. Can we give a round of applause for the cover? Seriously...it's beautiful! The best of the trilogy by far! Bottom line: Readers will be happy to see more than a few characters from Tantalize and Eternal make more than just a quick appearance. A great way to end a trilogy.